We celebrated a wonderful Father’s Day this past week-end. Usually Father’s Day in Italy is on March 19th but for some reason or another we’ve always celebrated it on the third Sunday of June like in Canada. Seeing as the kids were all away last week on various school trips they hadn’t really managed to prepare anything special for their beloved Papa. The panic started setting in on Friday evening so by the time I woke up on Saturday morning all three kids were standing by my bed ready (and stressed) to start crafting. They decided they wanted to make a really special breakfast in bed. 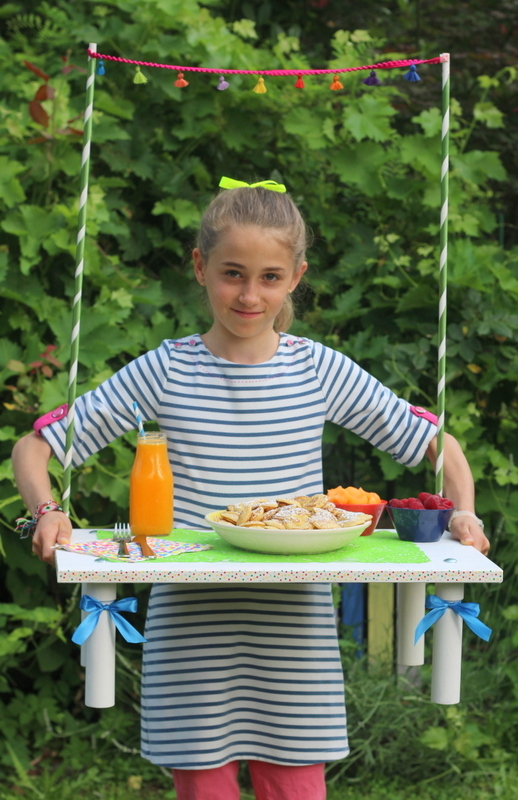 They wanted to serve fresh fruits, poffertjes (miniature Dutch pancakes), freshly squeezed orange juice and they wanted it served in an extraordinary manner. After some discussing and sketching we had come up with what we wanted to do and a list of things needed to be bought at the local diy. 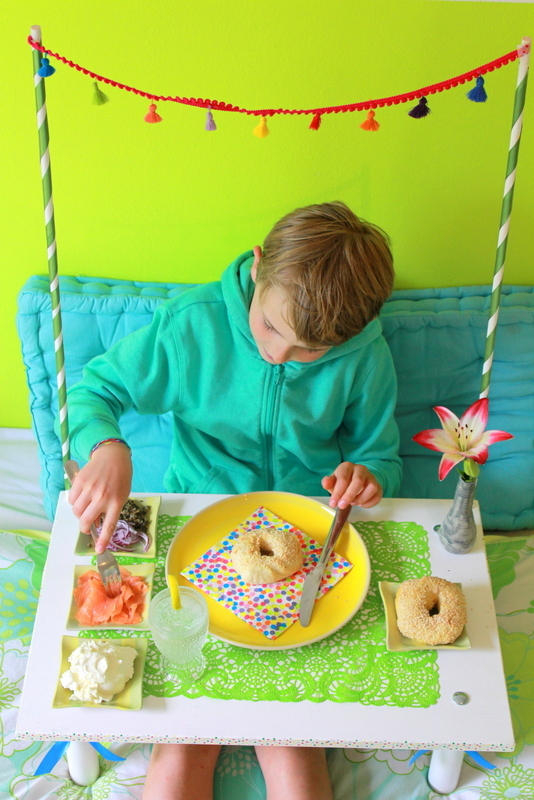 The idea was to make a festive breakfast-in-bed table with some over the top decorations. We bought a piece of wood, 4 wooden furniture legs, a long wooden rod (which we cut in half) and some screws. For the whole afternoon we were busy sanding, sawing, drilling and painting before it was ready for the fun part. Decorating. We used Washi tape to decorate the edges of the table, some ribbon for bows and to wind up the poles and then we sewed our much loved tassels (bought in Morocco) to some pompom string. The end result was exactly what the kids had in mind. It may be a little kitsch (ok a lot) but it definitely let’s the person being served breakfast-in-bed know (loud and clear )that they’re special and loved. We even managed to only spill one full bottle of juice on our bed during the ceremonial breakfast. That’s serious progress from last time. And of course the little one of the family insisted on being served lunch in bed to get the full feel of the festive-breakfast-in-bed -table experience. This will become standard practice for any special occasion, vip visitors or just when we feel a family member is in need of little extra attention and love. We’ll be able to easily change the decorations for every occasion as well. I’m thinking miniature garlands, pompoms, special placemats and napkins! The options are endless. It was just the best Father’s Day! I drilled the holes, sawed sticks and opened paint cans without really knowing what it was for. But when I saw the result, it was just magnificent. What a way to wake up on Sunday morning. Seriously awesome!! I wouldn’t mind one single bit to wake up to such a beautiful sight!! I love this! (and love the comment from Papa 🙂 ) And I love the idea of having the decorations changing for different occasions… looking forward to seeing the tray Santa will get! 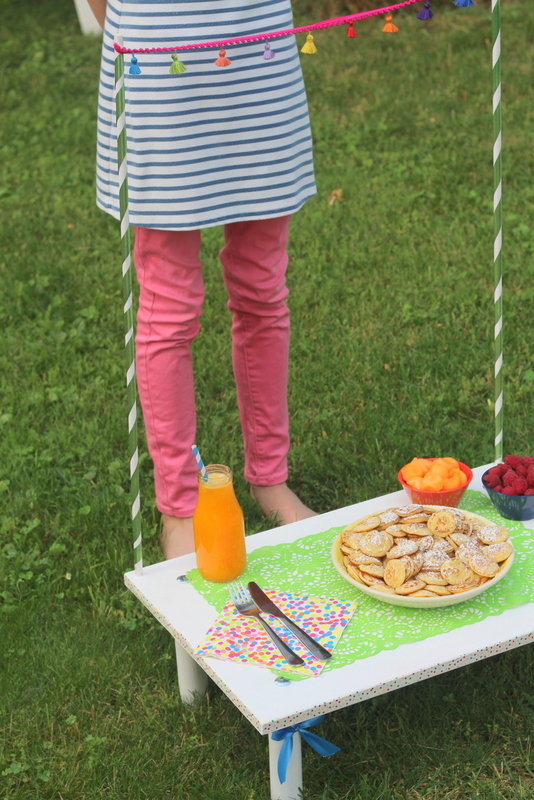 Wow, having breakfast from this festive table must be awesome! Hilarious that Papa didn’t find out and even contributed to the final piece 😉 Everyone looks so proud! Hmmm poffertjes!